On the SPSS Statistics Variable View tab, the third column provides a spot to set the width for your variables and the fourth column is where you indicate the number of digits that appear to the right of the decimal point when the value appears onscreen. Width and Decimal settings on the Variable View tab. The width setting in the definition of a variable determines the number of characters used to display the value. If the value to be displayed is not large enough to fill the space, the output will be padded with blanks. If it’s larger than you specify, it will either be reformatted to fit or asterisks will be displayed. Certain type definitions allow you to set a width value. The width value you enter as the width definition is the same as the one you enter when you define the type. 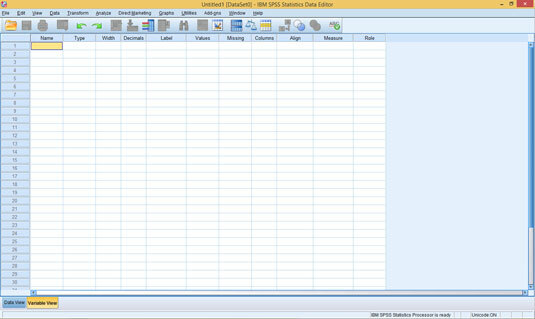 If you make a change to the value in one place, SPSS changes the value in the other place automatically. The two values are the same. Skip this cell and accept the default (or the number you entered ­previously under Type). Enter a number and move on. Use the up and down arrows that appear in the cell to select a numeric value. The number of decimals is the number of digits that appear to the right of the decimal point when the value appears onscreen. This is the same number that you may have specified as the Decimal Places value when you defined the variable type. If you entered a number there, it appears here as the default. If you enter a number here, it changes the one you entered for the type. They’re the same. Skip this cell and accept the default (or the number you entered earlier under Type).